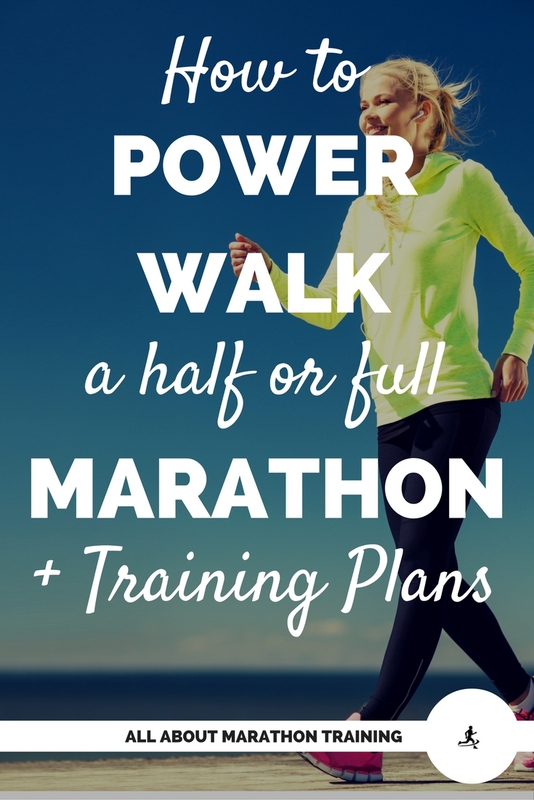 Power Walking a Half or full Marathon + Training Plans! Can you train for a half or full marathon by power walking the entire thing? Absolutely! That is the beauty of the marathon. It is for everyone! You don't have to be some super fit running nut to be able to complete a half or full marathon! Just walk it and earn it! Who is Power Walking for? Low to moderate intensity level - high intensity level - you need to have the aerobic capacity to sustain. high intensity level - you need to have the aerobic capacity to sustain. What exactly is Power Walking? To start let's be clear that we are not talking about the race walking that you might see in a competitive racing atmosphere that requires certain rules to adhere by. We are merely talking about walking at a faster than normal speed and pumping the arms emphatically. Let's break it down and talk about these two components. Walking at a faster than normal speed is walking at a speed that is on the higher end of the walking gait. The difference between walking and running is the flight phase in running where both feet are lifted off the ground. When walking, at least one foot is contact with the ground at all times. Power walking is on the upper end of the walking gait cycle, just before you might take both feet off the ground and start running...but you don't, you keep ground contact. Pumping the arms gives you a greater amount of momentum to carry you forward at these faster speeds. Try walking fast without pumping your arms. Then try walking fast while pumping your arms. Doesn't that just feel so much more natural and easier! So get those arms swinging to help you keep that fast momentum! How fast can a Power Walker go? An average walker can walk a mile in about 12-20 minutes. If you are power walking, you will probably be closer to 12 minutes a mile. See this pace calculator to find out your pace and finishing times for certain race distances at your current pace. 1. Always start with a slow warm-up period. You don't need to jump straight into your power walking session. First make sure your muscles are warmed up and your joints are lubricated so you can stride a long comfortably when you pick up the pace. Aim for about 5-10 minutes of warming up. 2. Pick up the pace! Once you have completed a warm up start to bring your arms up into a full arm swing forwards and back. Move your feet faster. Remember: You don’t have to move as fast as possible. You don't want to trip or fall because you were moving at a pace that you couldn't quite keep up with. Move fast but at a pace that you know you can comfortable maintain. 3. If you are power walking for more than 1 hour you may want to include some light stretching after that first hour. This will help to reduce soreness after your workout and will keep your muscles more flexible instead of everything tightening up on you. 4. Include a cooldown - slow down your speed for about 5 minutes and then include some light stretching. To build extra strength into your routine, you may choose to carry a pair of dumbbells with you. Start at a very light weight - probably just 1 pound, so that you don't injure yourself. Check your breathing rate. Walking at a fast pace will increase your breathing rate but you should not be out of breath. Keep your neck tall but your shoulders down. Hinge forward slightly at your waist. Don't slouch at the shoulders. Keep your back straight but just give a slight lean to your upper body at your waistline. Keep your abs tucked in tight to increase your core engagement. When walking up a hill, squeeze your buttocks to allow them to do a lot of the work of pulling you up. You can also concentrate on tightening your glutes when you are on level ground. It's good for your booty and will make it stronger! No matter what your fitness level there is a plan for you. I think that unless the training plan is geared towards meeting a certain time goal, almost any plan can possibly work for you. Even if the plan includes intervals or hill training! Just speed up your walking pace for the intervals during the time it calls for. Pump it out on the hills and you will greatly increase your strength and aerobic capacity. Start to Run Program - instead of running though you can just stick with walking at faster speeds. The 12 Week Half Marathon Weight Loss Challenge includes a training plan just for walkers! The fitbit is a great accessory for walkers who want to know their steps taken, calories burned, & distance plus tons of other info! Love, love, love Jessica Smith! First check out all of her free videos on her YouTube channel. Perfect for all fitness levels and busy people! A great guide to walking the full marathon. No detail left unturned! Now of course you don't have to commit to a fierce power walk the whole time during the marathon or half marathon. You may want a more recreational pace and just slow down and really enjoy the whole experience. Just be aware that most races have time cut-offs since they are closing down roads and taking volunteers to help provide a comfortable environment for the race attendees.